I'm aiming for a simple Christmas this year. I'm refusing to get caught up in all the business that usually comes with Christmas and instead am aiming to slow down. I'm doing this by being ruthless with the tasks I decide to take on. I'm starting with our advent calendar. 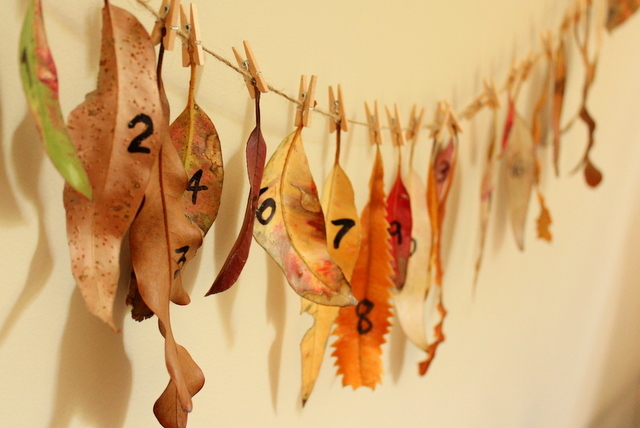 Last years leaf advent calender was super quick and easy, so we'll make one the same this year. But last year, I complicated our life by making it an activity-orientated calendar, identifying a different nature play or eco craft activity for each day. It was fun, but really, I was simply adding more tasks to our already busy schedule. Little Eco was more excited about the calender and being able to remove a leaf each day than the activities. So this year there will be no activities or gifts associated with each day. We'll simply remove a leaf each day and focus on counting down till Christmas. Based on Little Eco's excitement for the calendar last year I know this will be more than enough. Speaking of 'more than enough', I wrote about our 'less is more' approach to Christmas over at Childhood 101 today. Are you already overwhelmed by the business of Christmas? Do you have a super long 'to do' list? Perhaps you could also be a little more ruthless with the tasks you decide to take on? Don't forget the Planet Boab giveaway.